I was just curious whether you found the nine mismatched puzzle pieces in the same pack, or whether there were a few in each pack. I got the five McSnoremick pieces in one pack, and the four Buck Tales in the other. Why are the silvers and gold now pulling over $800? Because there is one person that is determined to win one of every title, regardless of cost, of both the golds and silvers. And so far they have. The other collectors that want to win one, any one, just keep pushing the bids higher and higher, but always lose. About $23K spent so far, and there are still a few more titles to go for complete sets of both. Round 2 should go for a lot less. I can see one person putting in a crazy bid; but for someone else to also agree to push the auction with the risk of having to drop 700 on a card is pretty bizarre. Another weird Lost Wacky situation. I guess we need to expect the atypical with these cards. I am assuming this must be a last resort for their collection. Maybe they have everything else. Maybe they have a big wallet. Well, I opened them. Since they were free, I figured it wasn't really a loss. I have a full LW3 set now, but two incomplete puzzles. Based on his nice gesture, IMO, if you emailed him & asked if the puzzles were supposed to be split or not in the packs (I don't think they are supposed to be, since his ebay auctions usually say which puzzle is in the pack) I'm sure he would send you the puzzle pieces to complete 1 or the other. Sounds like the 2 variation packs got mixed up somehow. I've been trying to understand what the big appeal is over "Lost Wacky" Series 3 and I really don't get it. For the most part, the gags and art have been getting progressively inferior since series 1. And based on the ridiculous ebay sales, we'll undoubtedly see a Series 4 (and probably more). The question now, is how many more people are going to get lured into "collecting them all". Remember folks, they're "lost" for a reason. Almost true. They may be "lost" but they're not wackys. Hopefully someday the art will see the light of day. 'cause they're psycho. and rich. So, eccentric, I guess. WOW! Just on LW3 Golds and Silvers? It's a total sham. He's running up his own auctions. Probably hasn't sold a thing. My points exactly, Neil, well said....er, well "written"
Wouldn't that be costing him a lot in ebay fees? I do like the idea of featuring certain Wacky characters as stand-alone portrait titles. $1K, you think? Seems like an awful lot for a peepshow! There's no copyright on these, so what's to stop me from buying it and making a 1000 of them, and then selling them for $1 each? Heck, I don't even have to buy it; I can print it from the auction photos. This is insane. They are just throwing Photoshop backgrounds on these things and printing them up as they go. These are from 2018 not 2011. What a farce. It's literally stealing. and here comes the "lost" stickers of pics of Wacky Boxes to go with box checklist that showed up earlier. Just the white backs for now. Probably not long before all the 'rare' variations show up. images for the entire set are included along with the auction for just this 'bonus' card. 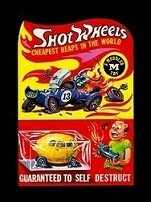 along with the 3 bonus cards showing a mock '92 box, the Wacky Truck and a '79 case. All box images are clearly Greg's. The image of the Wacky Truck appears to be my truck. Between the fact that it's a Garbage Can-dy version and it looks like they even attempted to repair the one torn corner of the cardboard backer. Hey, where are my royalties!?!?!? I could imagine that Wacky-izing photos of various vintage Wacky merchandise could be cool.. T-shirts, the glasses, etc. You add that bold black border to some okay photos and it really sells it. Of course Topps feels it is smart to REMOVE that trademark bold border design element from Wackys for some boneheaded reason. Just shaking my head while I am picturing these guys sitting at a table, brainstorming on what sticker to do next. The Diamond one, I bet they were all high giving themselves over that one. Human nature is odd. Everyone knows these are not a Topps product, whenever they were/are produced. So what's the appeal? I can't imagine, but chaque un a son gout. LOL . I was wondering if that was yours. I have no interest in any of the lost wackys stuff, but the box stickers are cool. LOL. Now you’re going to be hooked. Go for the gold set! It will be fun trying to spot which boxes are mine!